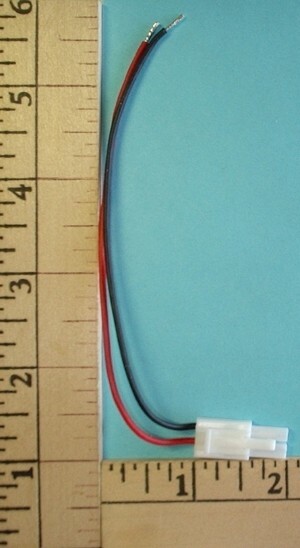 Use to build your own single or multi-charge cords for single cell Bind and Fly battery packs. 26 gauge wire (heavier than normal). Found on larger single cell models (generally 300mah and up). Use to build your own single or multi-charge cords for single cell Bind and Fly battery packs. 22 gauge wire (heavier than normal). This is the plug found on charge cords and ESC battery inputs. Kyosho / Tamiya Standard Male with Clip and wire, 'Til It's Gone! Approximately 22 gauge Zip cord wire about 36" long. This is the plug used on all the GWS battery packs. Often incorrectly called JST. JST is a company that makes many many plugs! Introduced to the hobby as BEC plugs by Futaba decades ago, Even GWS calls them BEC plugs. Since we like to be accurate, we call them BEC plugs here too. All single end plugs are 5 for $8, discount taken on invoice, won't show on your web order form. Mix and match any way you choose. 3" BEC extension. Male BEC on one end female BEC on other. This is the plug used on all the GWS speed controls on the battery input. Birds and bees lesson - gendered by plastic jacket, not the pins, so this plug has male pins yet battery plug fints inside this plug making this plug female. We use these plugs 0 to 8 amps. Deans mini plugs should be considered also for 6 to 10 amps Often incorretly called JST. 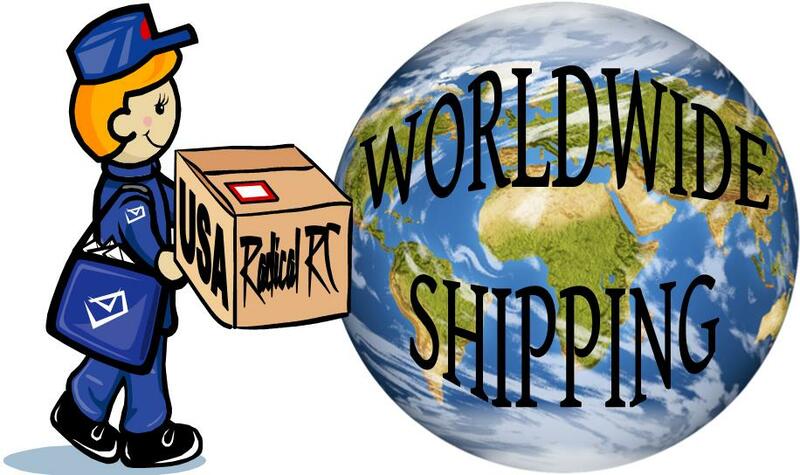 JST is a company that makes many many plugs! Introduced to the hobby as BEC plugs by Futaba decades ago, Even GWS calls them BEC plugs. Since we like to be accurate, we call them BEC plugs here too. Allows you to plug two battery packs into "ONE" ESC. Series Y Makes packs into series, thereby doubling the voltage but keeping the capacity the same. So, if you plugged a 1S pack and a 2S pack you'd have 3S (12.6V) at the ESC. Allows you to plug two battery packs into "ONE" ESC. Parallel Y Makes packs into parallel,increasing your battery capacity. Important that you use same manufacture and capacity batteries. So, if you plugged a 2S pack and a 2S pack you'd still have 2S (8.4V) but more mah at the ESC. BEC to Mini Kyosho Adapter 3"
BEC to Mini Kyosho Adapter with 3" extension. E Flight, connects ESC/Kyosho plug to a BEC battery connector. 3-4" Y harness built in our shop with genuine Deans Ultra connectors. 3 batteries in series into 1 ESC. 14 gauge heavy duty wire. Use to add the voltage of 3 matched capacity packs together for higher volgat use. For example, 2 each 3S 4800 packs and 1 each 2S 4800 pack will yeild an output of 8S @ 4800mah. 2 batteries in series into 1 ESC. 14 gauge heavy duty wire. Use to run two packs in series to increase voltage. For example run a 2S 3000 and a 3S 3000 so your battery output to ESC is 5S 3000mah. 3-4" Y harness built in our shop with Deans Ultra connectors. 2 batteries in parallel into 1 ESC. 14 gauge heavy duty wire. Use this part to run two battery packs together to douple available amperage while keeping voltage the same. Matched packs are reccomended. batteries into 2 parallel ESC's. 14 gauge heavy duty wire. Lets your double capacity, for example you can run two 11.1 (3S) 2100mah packs together so they function just like 1 3S 11.1volt 4200mah pack. Great way to economize smaller packs you already own into your new larger projects. A must for large scale electric airplanes. Simply install the receptacle to the fuselage side and connect the battery and ESC. Plug or unplug the connector key to turn the power on and off. Compatible with Ultra Dean's connector. Priced per one package as pictured. 36 inch Pigtail with Tamiya Block MALE CLIP plug added to one end. Opposite end is soldered tip bare wire with no connector. 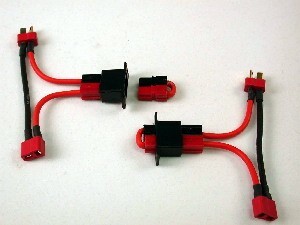 2 Pole Battery Male HPI Pigtail. LOOKING FOR A DEAL? Male or female and two or three wire single end leads/pigtails are quantity of 5 for $8, regularly $2 each. Select your option below. 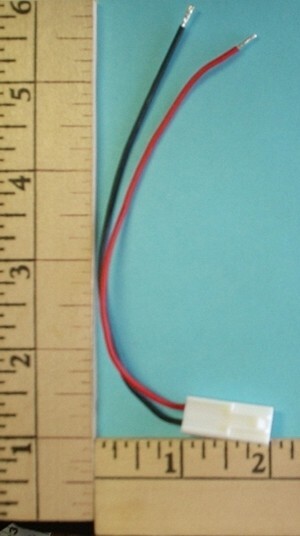 BEC/JST Battery to Deans 2 Pin Polarized ESC 2" Pigtail. Custom built in our shop using Genuine Deans Plugs. From Deans 2 Pin Polarized Battery to BEC/JST ESC 2" Pigtail. Custom built in our shop from Genuine Deans Plugs. From Deans Ultra Battery to Deans Mini 2 Pin Polarized ESC 2" Pigtail. Custom built in our shop from Genuine Deans Plugs. Deans Mini 2 Pin Polarized Battery to Deans Ultra ESC 2" Pigtail. Built from genuine Deans plugs in our shop. Deans Ultra Battery to Anderson/Sermos ESC 2" Pigtail. Built from genuine Deans and Anderson plugs in our shop. Anderson/Sermos Battery to Deans Ultra ESC 2" Pigtail. Built in our shop from geninue Anderson and Deans plugs. Replacement pigtail for your Speed 480 set up. Heavy duty Genuine Deans female connector. Approximately 9" long. Replacement pigtail for your Super Sub C set up. Heavy duty Genuine Deans female connector. Approximately 9" long. Replacement pigtail for your Speed 480 set up. Heavy duty Genuine Deans Male connector. Approximately 9" long. Replacement pigtail for your Super Sub C set up. Heavy duty Genuine Deans Male connector. Approximately 9" long. A must for large scale electric airplanes. Simply install the receptacle to the fuselage side and connect the battery and ESC. Plug or unplug the connector key to turn the power on and off. Genuine Deans Ultra connectors for battery input and output. Mounts 2 15-45 amp Anderson Power Pole connectors side by side to fuse or project box surface. Flanges provided for screwing down. 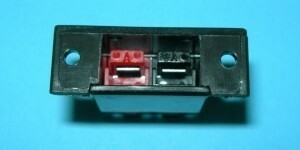 Same part as used in MPI6970 and MPI6972 Arming Switch. No fasteners or connectors supplied. Multiplex type 6 pin plug wired with silicone 210 strand (our S-480 wire). Gendered by the shell, not the pins. Use this parallel Y to get 2 battery packs into 1 ESC or 1 RX with EC3 plug. Pigtail approximately 4" long. Male plug shell, female pins. As an assembly, gendered as male as this connector fits inside the shell of the female when mated. Pigtail aproximately 4" long. Female plug shell, male pins. As an assembly, gendered as female as this connector fits over the shell of the male when mated. 2 Pole/Wire Pigtail Male BEC(Red JST) 6"
This is the male plug used on all the GWS battery packs. Often incorrectly called JST. JST is a company that makes many many plugs! Introduced to the hobby as BEC plugs by Futaba decades ago, Even GWS calls them BEC plugs. Since we like to be accurate, we call them BEC plugs here, too. 2 Pole/Wire Pigtail Female BEC(Red JST) 6"
This is the female plug used on all the GWS speed controls on the battery input. Birds and bees lesson - Gendered by plastic jacket, not the pins so this plug has male pins yet battery plug fits inside this plug making this plug female. We use these plugs 0 to 8 amps. Deans mini plugs should be considered also for 6 to 10 amps Often incorrectly called JST. JST is a company that makes many many plugs! Introduced to the hobby as BEC plugs by Futaba decades ago, Even GWS calls them BEC plugs. Since we like to be accurate, we call them BEC plugs here too. 2 pole female pigtail JST Micro White connector. These are the types of plugs used by Wes technic RX's, some GWS RX's and the Plantraco products. Comes with 26 gauge wire. White colored plug. Understand, Male and Female refers the plastic connector body and not the pins. $2.00 per lead/pigtail. 3 pole male pigtail JST Micro White connector. Used by battery on Plantraco RX, servos for Wes Technic, JST GWS RX's and is the same connector used on Spektrum/JR satellite remote RX extensions. Comes with 26 gauge wire. White in color. LOOKING FOR A DEAL? All Futaba, JR-Hitec, Airtronics(old) connectors, male, female and two & three wire battery male single end leads/pigtails are quantity of 5 for $8, regularly $2 each. If you need 4 or more leads, get your discount by entering the quantity of "5-pk" deals you want because your getting 5 connectors for the price of 4 at $8.00. 3 pole female pigtail JST Micro White connector. These are the types of plugs used by Wes Technic RX's, some GWS RX's and the Plantraco products. Used as the battery input for Plantraco RX's. Comes with 26 gauge wire. White colored. The connector used on GWS motors. 2 pin, 22 gauge wire, no polarity protection. Also used by some as a charging jack for RX's, but there is no polarity protection. Handy when wiring up onboard lighting systems and other projects. Female plug that is on the motor output side of GWS brushed speed controls. Non polarized, 22 gauge wire. Handy when wiring up onboard lighting systems and other projects. If you wanted to use your firebird battery with a different ESC or perhaps your plug in your airplane has gone bad, here is a pigtail to fix it with. May also be used to adapt your more sophisticated chargers to your Firebird type battery. Used by other manufacturers as well. 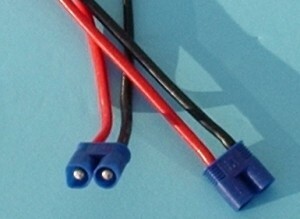 2 Pole Silicone Pigtail with Female Tamiya/Kyosho type connector. ~6" long. Photo is for display only. You get one pigtail at this price. Kyosho / Tamiya type Mini Male with Clip and 18 gauge wire, 'Til It's Gone! These are cut offs from charge cords we reprocessed into communication sattelites. ;-) Get a bargain here. Wires are zip cord and about 4-5" on each. 2 Pole Silicone Pigtail with Mini Male Tamiya/Kyosho type connector with clip/lock. ~5" long. 2 Pole Silicone Pigtail with Mini Female Tamiya/Kyosho type connector. ~5" long. 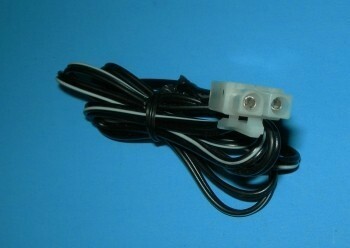 Female Pigtail, used on battery or hot side of circuit. They come stock on the blue and yellow packs that seem to puff in a 5 to 10 charges. A lot of people come in the shop and have these replaced with Deans or Anderson. 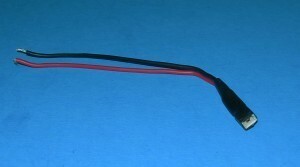 Male Pigtail, used on ESC/Charge cord end (cold side of circuit). They come stock on the blue and yellow packs that seem to puff in a 5 to 10 charges. 2 Pole Silicone Pigtail with Male with Clip Tamiya/Kyosho type connector. ~4" long.